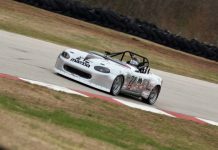 ALTON, Va. – The Hoosier Racing Tire SCCA Super Tour saw more than 500 competitors descend on Virginia Int’l Raceway this weekend for top-level competition and to prepare for the SCCA National Championship Runoffs in October. 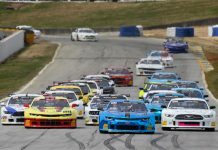 The Super Tour event – hosted by SCCA’s North Carolina Region on the 18-turn, 3.27-mile road course – didn’t disappoint Sunday, as several close races developed throughout 28-car classes competing across nine race groups in 35-minute events. The F Production race Saturday was thrilling, indeed. That excitement started right back up again Sunday morning as Charlie Campbell’s Mazda Miata put a solid gap back to the rest of the field. Eight laps in, however, a full-course yellow bunched the field back up and put Saturday winner Ken Kannard’s Mazda Miata and Kevin Ruck’s No. 73 Hoosier/Honda Acura Integra right behind Campbell. On the restart, the top three FP competitors stormed off to settle things among themselves. On the final lap, Kannard got by Campbell, but spun in a corner. From there, it was left up to Ruck and Campbell, with Ruck holding a slight advantage. Some top GT-1 drivers were also on hand at VIR this weekend to wow spectators. Tony Ave, in the No. 04 Chevrolet Corvette, was on pole and set the pace Sunday after his car broke Saturday and slid into a tire wall while leading. After a full-course yellow, Ave found himself hounded by David Pintaric’s Cadillac CTS-V and the Jaguar XKR of Michael Lewis. While Pintaric poured on the pressure, Ave held tight for the win Sunday. The Spec Miata race, coming in just short of 65 competitors Sunday, was another barn burner. The usual cast of characters were in the hunt, including Tyler Kicera, Jim Drago, Todd Buras and Elivan Goulart. But as the laps ticked away, the fight for victory was between Nicholas Bruni, Preston Pardus and Danny Steyn. At the finish line it was Steyn in the No. 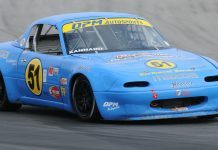 39 Adept Studios/Rossini Engines/OPM Autosports/G-LOC Brakes Mazda Miata who was .118 of a second ahead of Pardus. “I want to congratulate Preston and Nick,” said Steyn, who also won both Super Touring Lite races over the weekend. “The three of us went side by side into the top of the roller-coaster (corners). We had a very slight touch, but such clean racing with good friends. Spec Racer Ford Gen3 racers presented another formidable field Sunday, with nearly 55 drivers taking the green flag. After spinning off course during Saturday’s race, Robeson Clay Russell claimed the lead early in Sunday’s race and led flag to flag in his No. 31 SVN/Angry LLama/Comprent. But make no mistake, competitors Brian Schofield and Saturday winner Tray Ayres were right on his tail. This weekend’s GT-3 Hoosier Super Tour events at VIR took on special importance, as both races were part of the GT-3 Challenge presented by MPI, a series supported by Mazda, Max Papis Innovations, Penske Racing Shocks, AiM Sports and Hoosier Racing Tire. The GT-3 Challenge consists of five events held around the country, culminating with October’s SCCA National Championship Runoffs. As a class, GT-3 is gaining momentum once again, with two competitive and exciting races this weekend. It was Stacy Wilson, driving the No. 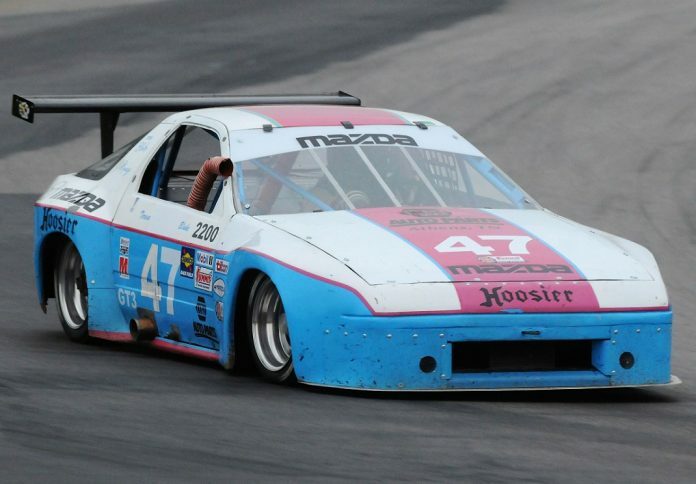 47 Hoosier Tire/Mobil 1 Mazda RX-7, who managed to win both races, but not without a fight Sunday from Taz Harvey. The two swapped the lead a couple times, but touched with only a few laps remaining. To view a full list of class winners, advance to the next page.